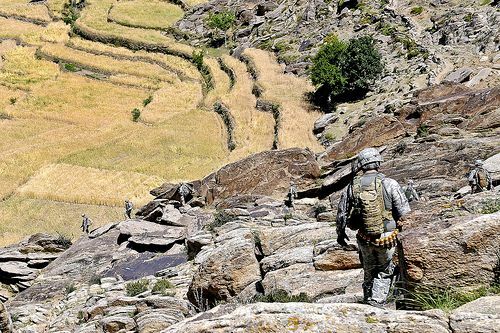 LAGHMAN PROVINCE – U.S. Army Soldiers with Company B, 1st Battalion, 102nd Infantry Regiment, Task Force Iron Gray, move through the mountains on a patrol to Kusuk village in eastern Afghanistan’s Laghman province, on May 24. Photo via the US Army by Staff Sgt. Gary A. Witte, 300th Mobile Public Affairs Detachment.